The first mention of truffles appears in the inscriptions of the neo-Sumerians regarding their Amorite enemy’s eating habits (Third Dynasty of Ur, 20th century BC) and later in writings of Theophrastus in the fourth century BC. In classical times, their origins were a mystery that challenged many; Plutarch and others thought them to be the result of lightning, warmth and water in the soil, while Juvenal thought thunder and rain to be instrumental in their origin. Cicero deemed them children of the earth, while Dioscorides thought they were tuberous roots. The Provencal name for the truffle is “rabasse”. A more popular synonyms is “black diamond”. In fact, truffles come in black and white, and in numerous variants of each of the two colors. The truffle is a type of subterranean mushroom (tuber melanosporum), growing around the roots of plants, mainly oak trees and sometimes lavender or thyme. A typical truffle farm (truffière) today is a plantation of oak trees, either hidden in the wilderness or well fenced and guarded during the winter. Average sized truffles generally weight between 30 and 60 grams. 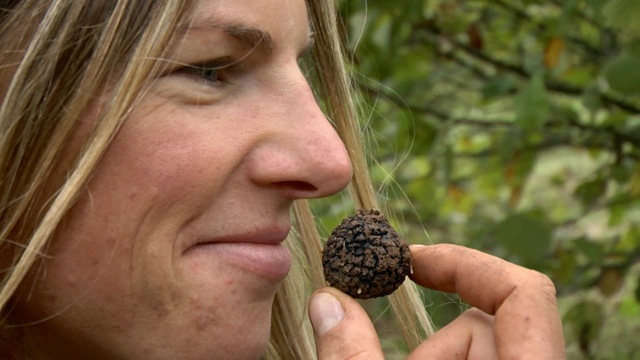 In the Alpes-Maritimes, truffle hunter Patrick [see “Truffle Finders”] once found a truffle that weighed in at 364 grams. Karine Magnin, co-owner, Les truffières de Crépey, Burgundy, France. Truffles can be cultivated. 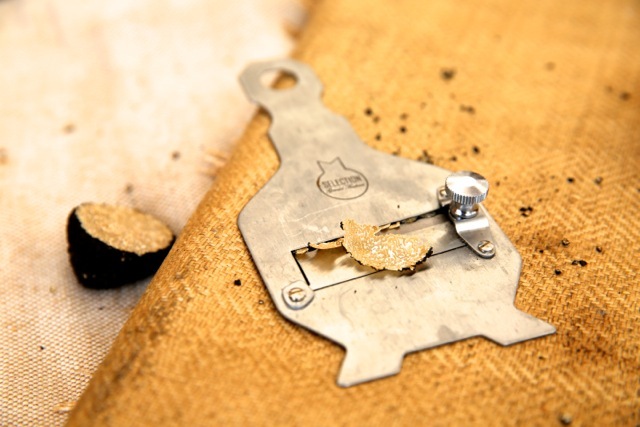 As early as 1808, there were successful attempts to cultivate truffles, known in French as trufficulture. People had long observed that truffles were growing among the roots of certain trees, and in 1808, Joseph Talon, from Apt (département of Vaucluse) in southern France, had the idea to sow some acorns collected at the foot of oak trees known to host truffles in their root system. It takes about 40 years for a wild oak tree to grow to a point where truffles will be created. You can, however, obtain specially treated young trees that will grow to truffle-maturity in about 10 years. In the larger truffle markets you’ll find professional truffle-tree vendors that can provide you with the young trees and with expert advise about planting and maintaining them. Karine and Cyrille Magnin (Karine is our truffle hunter in the film) are the owners of Les truffières de Crépey, in the prestigious Côte des Vins, in the village of Crépey, Burgundy, France. If you are interested in getting started in the truffle growing business you will need some land and a good dose of patience. “In order to start a plantation you need to buy plants that are Mycorrhizas plants that are one year old and were grown in truffle in soil containing truffles. You line them up and plant them every 2 to 3 meters and next you plant and water. The plants need to be watered regularly during the first couple of summers. After that no particular care is needed, other than removing weeds around the plants, either by machine or by hand. Almost any type of dog can be a truffle hunter because of their great sense of smell. The very best truffle dogs are the one’s that “do not hunt.” Poodles and similar breeds are very good. There is an Italian dog, the Lagotto romagnolo that has been specifically bred for truffle hunting. They do it from birth. However, even dogs from the pound can be very good as long as they are properly trained and get along very well with their owner. “In order to train a dog to find truffles you need to teach it that it’s a game, you need to motivate it and reward it after each effort. In the beginning you need it to find something interesting in the ground, like gruyère (cheese), something edible in order to enhance its sense of smell. One of the best works you have done. I love the video, bravo…the production value is excellent, the subject, musical score, movie script and article is simply wonderful. You have outdone yourself on this project. BRAVO!!! Thanks so very much for your comment Len. I was hoping you would be pleased. I have enough video material to make a very good 30-minute program. Looking for distribution.